As reflected in Broody’s flying hours for the month, Squadron activity increased in July after a lull in June on account of poor weather. In the early part of the month, many crews were forced to land at either Hurn or Ford on account of poor visibility at Zeals. On 28/vii/44, the Squadron moved some 25 miles north to RAF Colerne. Aircrew were billeted in tented accommodation. Hazy. Generator U/S, so back in after one circuit & an overshoot for a Spitfire. The loss of Bunting and Spedding no doubt overshadowed the jubilation that was felt back at base after the return of F/Lt George “Jamie” Jameson DFC and his Nav/Rad F/O Norman Crookes DFC, who had claimed 3 enemy aircraft destroyed and one probably destroyed during one 4 hour patrol. Jameson’s “Personal Combat Report” makes for fascinating reading. “I proceeded on the vector of 100 degrees at Angels 5 and the controller asked me to make my Turkey Gobble and told me that he could not give me much assistance. I saw light anti-aircraft fire 2 miles ahead and almost immediately a contact was obtained ie 05:02 hours range 2 miles 10 o’clock height 5,000 ft head on. I obtained a visual on a Ju88 range 1 mile against the dawn still approaching head on and at the same height. My navigator using Ross night-glasses confirmed the identification. Meanwhile I turned hard to port after the enemy aircraft following it by means of A.I as the enemy aircraft skimmed through the cloud tops. I closed in to 300 yards range at full throttle as the enemy aircraft was then doing 260 ASI. Meanwhile I saw a series of explosions on the ground caused I believe by the enemy aircraft dropping its bombs. Visual was obtained in a clear spot (with no cloud) and I closed in and gave the enemy aircraft 2 short bursts from dead astern. Strikes were seen on the fuselage causing a fire in the fuselage and port engine. The enemy aircraft went down through the clouds vertically and well alight and about 20 seconds later hit the ground with a terrific explosion. I reported the kill to Tailcoat and gave him a fix. The enemy aircraft was destroyed 5 to 6 miles S of Caen at 05:05. When I was doing a port orbit over the scene of the kill much window was seen and a contact almost immediately obtained ie 05:06 range 2 miles 11 o’clock height 5,000 ft. A visual was obtained very quickly on an enemy aircraft flying slightly above cloud. This aircraft was also skimming the cloud tops. I gave chase at full throttle to overtake. His speed was approximately 280 ASI. While giving chase another Ju88 came up through the cloud dead ahead one mile range and flying in the same direction as the former aircraft. I closed in rapidly to 400 yards range and confirmed the identity of the aircraft as that of a Ju88. The enemy appeared to see me and turned very hard to port diving towards a thick cloud layer. I followed on the turn and closed in to 350 – 400 yards when I opened fire from dead astern. Strikes were observed which caused a large fire in the starboard engine. The enemy aircraft was well alight and disappeared vertically through the cloud. At this moment I saw two aircraft approaching me through cloud and as I was satisfied that the former combat had ended in a kill and that the Ju88 would inevitably hit the ground I did not follow but turned towards the two aircraft whom I suspected to be customers. I closed in on both of them and I identified them as Mosquitos. Almost immediately after identifying the Mosquitos referred to above, I obtained a freelance visual on an aircraft 4000’ range same height 5000’ crossing starboard to port. I closed to 2000’ dead astern and identified the aircraft as a Ju88 which identity was confirmed by my Navigator. When I was about 300 yards behind the E/A it dived steeply to port towards cloud. I followed and gave two short bursts and I observed strikes from one of the bursts on the fuselage. The E/A took advantage of the cloud cover and I followed with the use of A/I though it was taking violent evasive action and dropping large quantities of window. When we were almost at treetop height visual was regained range 4000ft dead astern. The enemy had ceased evasive action. I closed in to 250 yards dead astern and gave it a short burst from which strikes were observed. The E/A pulled up almost immediately and turned to port with debris falling and sparks issuing from it. The enemy stalled and dived into a 4 acre field and exploded. The kill took place 5 miles S of Lisieux. I climbed to 5000 ft called Tailcoat and reported the kill and at my request was given a north westerly vector back to the scene of enemy activity. I once again saw A.A fire ahead above cloud and I headed towards it and at 05:22 hours contact was obtained on two aircraft and much window. (a) at a range of 4 miles 10 o’clock (b) 2 miles 10 o’clock. I decided to intercept the nearer of the two and obtained a visual dead astern at a range of 4000 on a Do217. The E/A must have seen me for almost immediately it dived into cloud and took very evasive action and threw out large quantities of window for several minutes in cloud. I followed through cloud using A/I and the E/A eventually straightened up at cloud base. Visual was regained at a range of 2000’ dead astern and below. I closed to 300 yards and fired a short burst. Strikes were seen on the fuselage which began to burn furiously. The E/A turned gently to starboard, pulled his nose up and the dorsal gunner opened fire a wild burst which headed in the wrong direction. The E/A dived into the ground in flames and exploded. Claim: 2 Ju88’s destroyed. 1 Ju88 probably destroyed. 1 Do217 destroyed. Information later provided by the 410 Squadron navigator, Sub/Lt Richardson enabled the “probable” to be confirmed as a kill. By strange coincidence, this was the very same Sub/Lt Murray Richardson who, along with 5 colleagues from the Fleet Air Arm, had been seconded to 488(NZ) Squadron earlier in the year! I think Jameson & Crookes’ successes tonight may be one of the greatest (but least well known) stories of the air war. In 30 minutes, and with the expenditure of only 90 rounds per cannon, 4 enemy aircraft were identified, tracked through cloud using A/I and destroyed. F/Lt George “Jamie” Jameson returned to his native New Zealand in August 1944 with a total of 11 enemy aircraft destroyed, 1 probably destroyed and 1 damaged, leaving him as the leading New Zealand night fighter ace of World War Two! In addition, the aircraft in which they flew, MM466 ME-R holds the honour of being the Top Scoring Mosquito fighter during the war, also with a total of 11 enemy aircraft destroyed. 6 of these were while she was with 488! 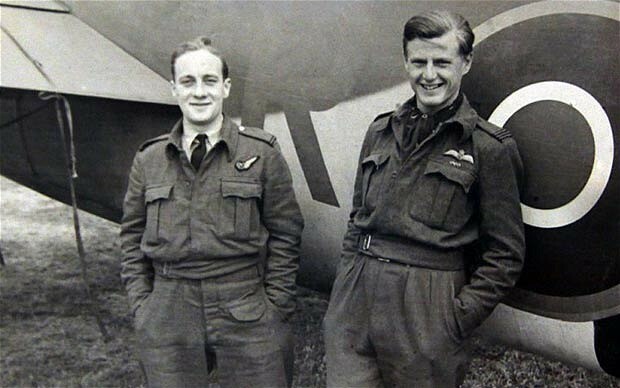 Norman Crookes (L) and “Jamie” Jameson (R) standing in front of ME-R.
On the night of 29&30/vii/44, eight crews took off on Patrols over France. S/Ldr Edward Bunting and his Nav/Rad, F/O Ted Spedding were chasing a FW190 at low level when they were hit by flak. Bunting managed to pass a message over the radio that they had been hit. This was followed by an explosion being seen on the ground some 15 seconds later. With no other information available, the crew were posted as “Missing, Believed Killed”. 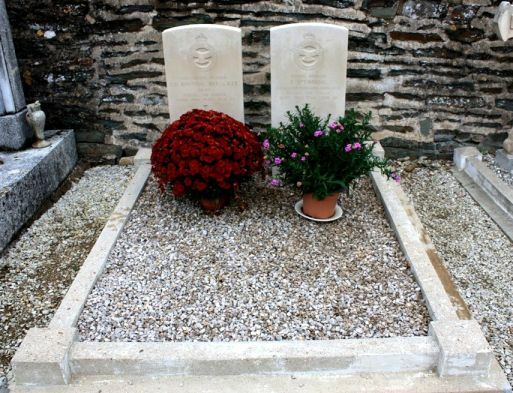 Sadly, neither man survived, and were interred in a joint grave at St Remy churchyard in the Calvados region of France. On 27/vii/444, F/Lt WTM Clark paid another visit to 488(NZ) Squadron from North Weald. On this occasion, he was able to team up with his old pilot, Doug “Robbie” Robinson and fly 2 operational sorties. This came about as Robinson’s regular Nav/Rad, F/O K.C “Cherub” Keeping was on the sick list. An off the cuff offer to fly with Robbie lead to the OK from W/Cdr Haine. “After various vectors my observer reported he had contact 2½ miles range 2 o’clock height 10,000 ft. We took over from Yardley and I obtained a visual on a Ju188 at a range of 600’ 10° above 12 o’clock. He was flying in a layer of haze proceeding north. I realised that my overtaking speed was too great and to avoid overshooting I throttled back. Enemy aircraft was doing 220 mph. He must have seen my exhaust flames at this moment and opened fire – Ventral guns which fired tracer and which disappeared below. There were no strikes. Enemy aircraft immediately peeled off to port and I followed and closed in to 150 yards range. We were both going down. I opened fire and gave him a short burst but here were no strikes, owing to the fact I had too much deflection. This was Robinson’s 3rd victory to date, and his second with Clark. 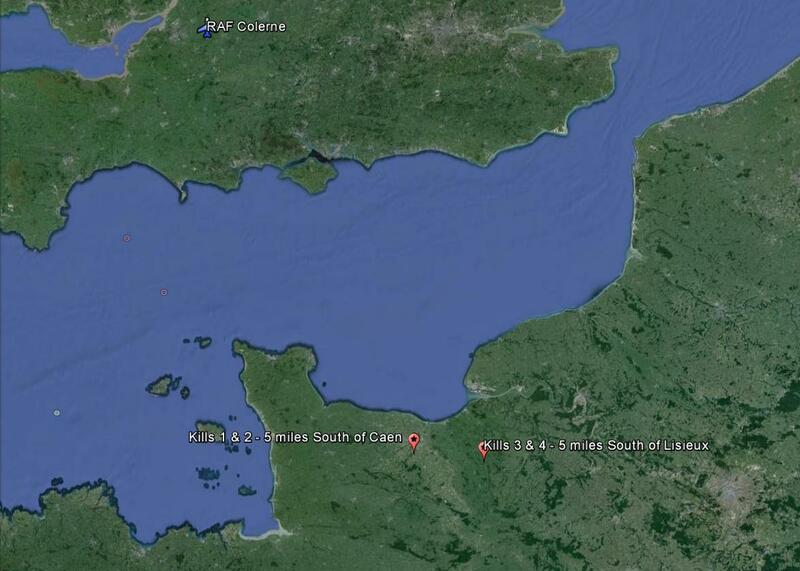 West of Cherbourg Peninsula & Bay de Mont St.Michel area. Several bogies – One Havoc, one Halifax, two broken off by control as friendly before contact & one no-contact suspected Hun almost out of GCI coverage. Down through 8,000 ft of cloud to land at base for a change. Quick test with W/Cdr Haine in thick haze. Instrument take-off in shallow layer of fog. One bogie right at the beginning – no contacts thereafter. N & S patrol across Seine estuary & no activity, Ground R/T failure. Tried Hartford Bridge, but sent to Ford. Landed after one unsuccessful attempt in fog. Cloud at 50ft at Ford, but clear by Winchester. After completing a Patrol in aircraft MM551 (ME-X), F/Sgt Howard Scott and F/O Colin Duncan, both New Zealanders, were killed when their aircraft crashed in woodland near Holmesley South whilst attempting to land at RAF Hurn in low cloud. There is little information available about the detail of this crash, which resulted in the first losses of the Squadron in almost 4 months. Both men were interred in the New Zealand Section of Brookwood Military Cemetery on 19/vii/44, with Irwin Skudder and Tom MacKay in attendance representing the Squadron. 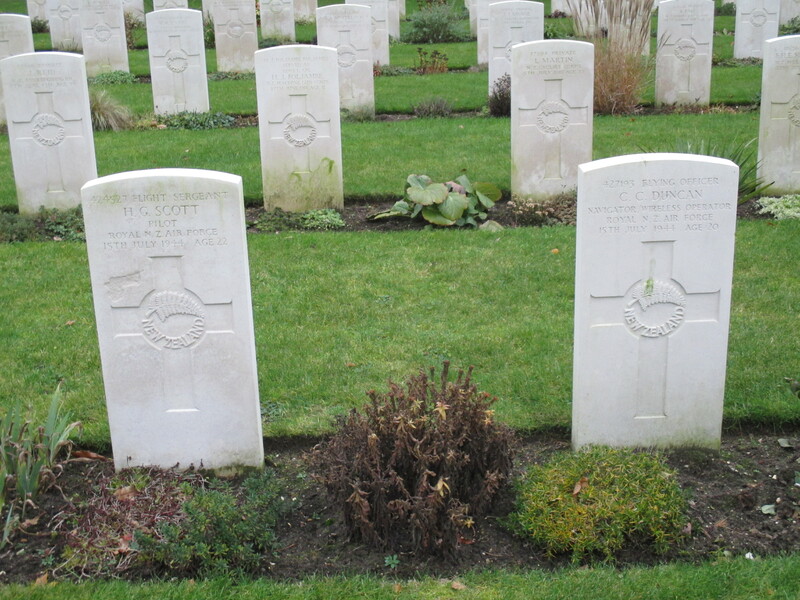 The graves of F/Sgt Howard Scott & F/O Colin Duncan. Their names are duly recorded in the Roll of Honour.